Very little information is available on this very rare process. Instead of immersion into a dye-bath the positive print was coated uniformly with a varnish. This technique can be identified by the lack on dyes in the perforation area and by the inhomogeneous application of the dye. Cherchi Usai, Paolo (2000): Silent Cinema. London: BFI. This system was used in laboratories before pre-tinted positive printing film was introduced on the market. There is little information on how this was carried out. Examples seem to be discretely painted or sprayed on one side only. 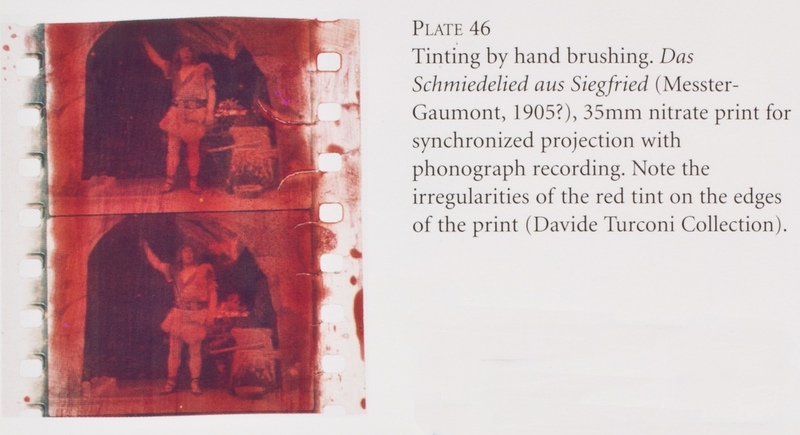 The description in the Agfa processing manual of about 1925 indicates that coloured lacquers were applied by roller to the image area between the perforations, of the film base, but film of this character has not been reported to the Editor [P.R.]. It seems that this technique was very uncommon.